Backups are important because as a publisher you want to make sure your content is always saved and easy to reach in the case of malfunctions, so it is a top priority for us to make sure our customers’ data is safe and we are glad to be able to offer our customers an easy way to access them: we have implemented a method to get either uploads or databases by just pressing a button, directly in the Dashboard – Development tab. A backup can be requested by the owner, administrator or developer of the instance and it can be done for uploads and/or database. 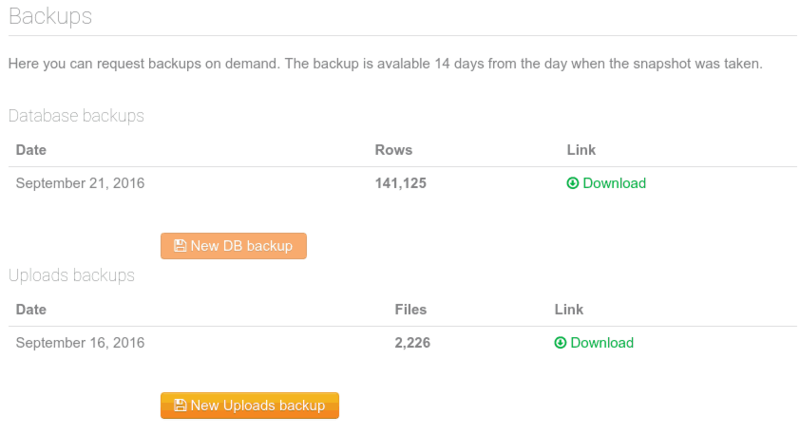 The backups contain the data from the time the site was migrated to Presslabs to the date the backup was requested. It takes some time for the backup to be completed and will be saved as an archive to the folder you select for download. To find out more about our backup policy, please check out our Help Center (https://www.presslabs.com/help/general/backups/backup-policy/) .